An estimate of the climate feedback of water is described below using global temperature measurements. The calculation is based on the assumption that dry arid deserts have essentially zero feedback from water, whereas regions dominated by large oceans have maximal water feedback. 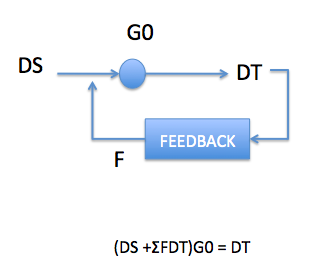 The result is a net negative feedback : -1.8 (+- 1.1) watts/m2/deg.C. AGW models predict “dangerous” global warming of 2-5 degrees this century by assuming net positive climate feedback values due to water of ~ 2watts/m2/degreeC . Water feedback is predicted to amplify an otherwise modest GHG rise of ~1 degree C by some 200-500%. The main mechanism argued for such large water feedbacks is the increased evaporation with temperature leading to enhanced H2O greenhouse effects. Is there any direct evidence that such large positive feedbacks are already occuring ? To look into this I selected weather stations from 2 different regions: A) The Sahara desert with very low humidity and B) South East Asia with high humidity. The assumption is that any H2O feedback will be present in B) but not in A). The two areas were chosen with exactly the same area and the same latitude: [15-28, -12-30] and [15-28, 120-140] and only stations with records from before 1950. The saharan stations were listed earlier here, and the 47 South East Asia stations are listed as a footnote . The average of temperatures over both regions are shown in Figure 1. There are clear differences both in the annual extremes and in the variations essentially showing the effects in Asia caused by the presence of large sources of water vapour. The Sahara temperatures have large daily and annual swings in temperature because there is little greenhouse effects from water vapour. 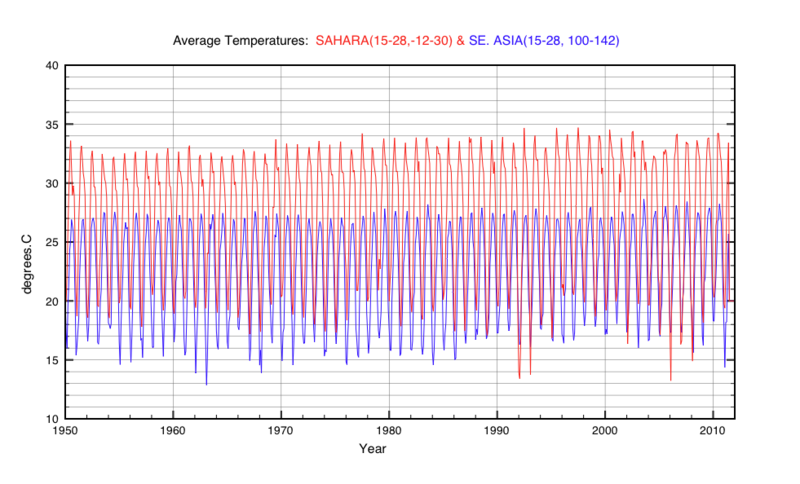 Figure 1: Comparison of average temperatures across 17 Saharan stations and 42 "oceanic" Asian stations at the same latitude. Average Anomalies for each region. The monthly data has been smoothed by a fourier fit and then fitted with a linear dependence DT = m(x-1950) + CV. These fits are shown by the two lines through each set of points, and are independent of the smoothing process. These can now be used to derive an effective water feed back value assuming that it is active in Asia but absent in the Sahara. DS is assumed to represent AGW and any natural effects including feedbacks other than water vapour and that it is the same in both regions. F(water) = -1.8 (+-1.1) watts/m2/degree C.
This result implies that the net climate feedback (sensitivity) to water is negative or at most zero. The data is incompatible with large positive values of +2.0 watts/m2/degreeC. as used in the majority of GCM models. The fact that 2 billion years ago temperatures were not much different than today despite 20% less solar radiation implies that the Oceans stabilize climate through negative feedback (see here). S.E. Asia stations used are listed here. This entry was posted in Climate Change, climate science, Science and tagged Climate Change, CO2, Feedbacks. Bookmark the permalink. 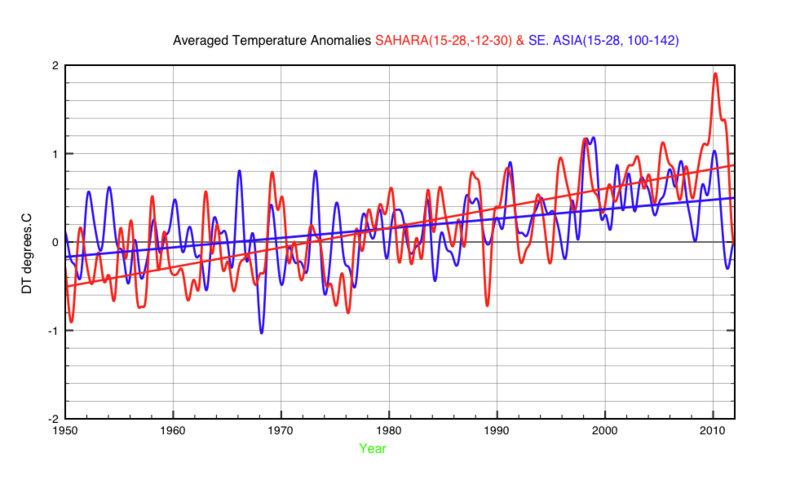 The graph shows the Sahara line increased in 60 years by 1.3 C, not 1.0 C. The SE Asia line increased in 60 years by 0.6 C, not 0.5 C.
How do you get “DS would need to be around 3.6 watts/m2 to cause a global rise in temperature of 1 degree[in 60 years]? The ‘no-feedback’ equilibrium sensitivity is about 0.3 C/W/m2. Assuming no feedbacks in the Sahara. You apparently used G = 1 C/3.6 W/m2 = 0.278 C/W/m2 for the 60 year transient sensitivity. How did you calculate this? The usual estimate of no-feedback climate sensitivity is 0.3 C/W/m2. You labeled the calculated feedback of -1.8 W/m2/C as a water vapor feedback, and compared this to a climate model water vapor feedback of +2 W/m2/C. Your value can not be compared to the climate model value because your value includes the effects of the lapse rate change and clouds. The direct sum of these is 1.65 W/m2/C, and this sum can be compared to your value of -1.8 W/m2/C. I assume the AR4 water vapour feedback includes the effects of evaporation, which is greatly underestimated. You are probably right here. I was just using a rough value taken from the Bony et al. review paper. I read that off as being +2 watts/m2. To my mind the AR4 figures quoted are anyway uncertain. But you should not use this as if does not account for the variation of temperatures by latitude and stratosphere adjustments. The standard value calculated by climate models for the Planck feedback is -3.3 W/m2.K.